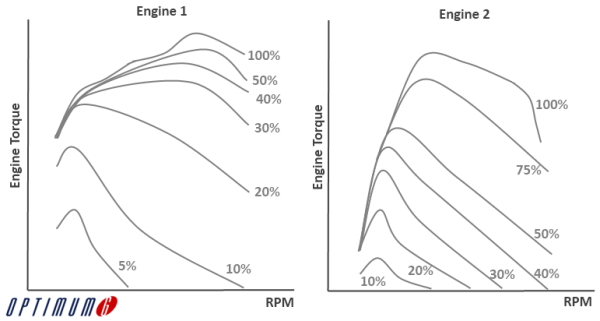 In our recent article on the need of power in Formula SAE, we briefly looked at the throttle response of a specific engine. Mapping throttle pedal position to engine torque is a powerful tool for many vehicle dynamics engineers. This mapping can be done mechanically through the use of throttle linkages and cams on the throttle bodies. In other cases this mapping is achieved through mapping an electric throttle body position to a throttle pedal sensor signal. 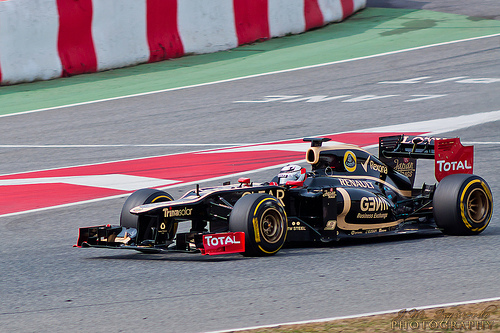 The latter is found on cars ranging from contemporary passenger cars up to Formula 1. On passenger cars the goal for the throttle map is usually to provide high resolution for common throttle positions such as stop and go traffic and driving around town. When car makers want to provide a sportier feel for a certain model, changing the throttle map is an easy method to achieve this. A more responsive throttle pedal is interpreted by the driver as a more powerful engine. Below is an example of two engines and their throttle response. It’s quite clear that the very different characteristics of these engines and their throttle response will result in two different driving experiences. Two different engines with very different throttle and torque response. The numbers by the lines indicate throttle pedal position. The other factor in terms of tyre wear that is important to factor in is the use of pedal maps; that is, the percentage of pedal application in relation to percentage of torque being used. A crude example could be if a driver says, ‘OK, when the throttle is at 30 percent, I want 15 percent of the engine torque.’ A soft pedal map is when a driver has quite a bit of modulation initially, but correspondingly he will always have less progression at the higher throttle positions because 0% and 100% throttle position have to correspond to minimum and maximum engine torque (again as per the rules) – i.e. anything you take at the start to increase progression will be paid for with a loss of resolution at somepoint later on. This, of course, has a huge effect on the manner in which the tyres are used as we have to be very specific for each driver, from track to track and even corner to corner to ensure as little wheelspin as possible. As engineers, it is in this mapping that one of the more enjoyable challenges lies. There are, of course, limitations that have been placed upon pedal maps so that a version of traction control doesn’t edge its way back into the sport and the FIA is quite strict on how we use pedal maps, especially on launch procedure. But Fridays now see us working incredibly hard to make sure that we hone our pedal maps for each corner and for each driver to make sure that they are happy with throttle application and power output. ← It is all about horsepower… or is it?